Mullet are a large, plump silvery fish of excellent flavour. They are very oily, and have a high fat content, and have a very rich distinct, strong fishy flavour. They are usually sold whole or as fillets. The raw flesh is pinkish grey, dark after spawning period. After cooked the flesh flakes easily is medium to firm and always tender. Sea mullet rate as fair to good table fish, their oily, somewhat fatty flesh being well suited to smoking, while sand mullet are arguably the tastiest of the mullet clan. All mullet should be cleaned promptly if intended for the table. Commonly 500g-1.5kg and 30-45cm, though Sea Mullet can grow to 8kg and Goldspot rarely grows larger than 30cm and 1kg. Mullet are a low priced fish. Usually sold as skinned fillets. In whole fish look for lustrous skin, firm flesh, and a pleasant, fresh sea smell. In fillets, look for pinkish-grey, firm, lustrous, moist flesh without any brown markings or oozing water and with a pleasant fresh sea smell. Make sure whole fish is scaled, gilled, gutted and cleaned thoroughly (remove stomach lining and any fat along the stomach wall). Wrap whole fish, or fillets in plastic wrap or place in an airtight container. Refrigerate for up to 2 days or freeze for up to 3 months below -18ºC. The lining of the abdominal cavity should be removed completely and the fat along the abdominal wall should also be scraped away. Average yield is 45%. Has a strong flavour, oily, moist, soft to medium-textured flesh with few bones, which are easily removed. Remove the skin, and fatty tissue underneath, for a milder flavour. To further improve the eating qualities of this fish, it is highly recommended that the black stomach lining be removed prior to cooking as it will cause the flesh to become bitter. Bake, grill, barbecue, smoke, pickle. Works well in fish pastes and pâté. Pinkish grey, darker after spawning period. Low to high, Mullets have a seasonally high oil content. They have a higher oil content during their migration (April and May), leading up to spawning. Rich, strong fishy flavour. Distinctive flavour. The flavour of the flesh varies slightly according to species. 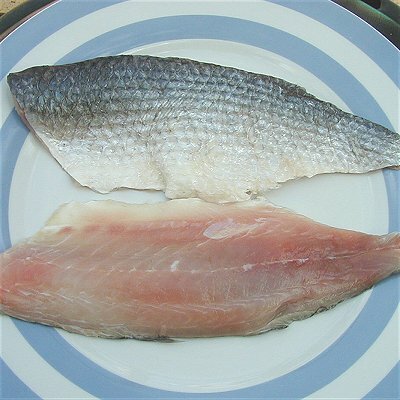 A lighter-flavoured fillet can be produced by deep skinning the mullet and discarding the fatty layer of tissue immediately under the skin.